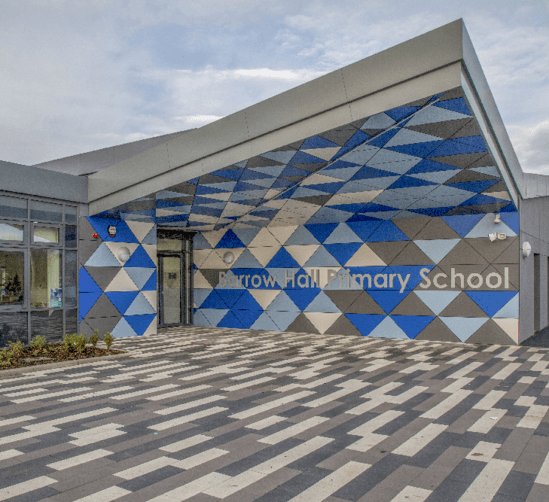 Ellis Williams Architects (EWA) were appointed to undertake the design of a new primary school in Warrington and specified VIVIX® by Formica Group for the external cladding of the new build. Engagement meetings were held during the development to ensure the design proposal met the satisfaction of the staff, pupils, parents and local residents and reflected the school’s ethos and identity. VIVIX® panels in Storm, Baikal, China Blue and Spectrum Blue decors were applied to the entrance of the school while panels in Carnaval, Maui, Spectrum Yellow, Vibrant Green and China Blue decors brought colour to the courtyard. The juxtaposition of vibrant colours against subdued greys helped in establishing a distinctive character and personality for the school buildings. 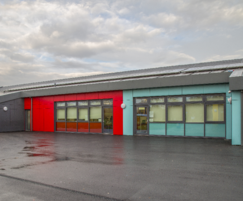 EWA worked closely with the school and local authorities to develop a design that avoided the pitfalls of existing building stock with due attention given to energy efficiencies and occupant comfort. The client brief specified minimal mechanical ventilation. 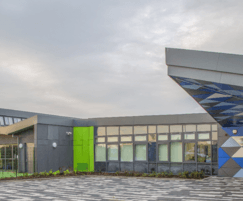 The application of 8mm thick VIVIX® panels for the school exterior offered multiple moisture shedding pathways to help keep the building dry and well-insulated. When used as part of a rainscreen ventilated system, VIVIX® panels can contribute to a building’s thermal efficiency. The former Barrow Hall Primary School occupied buildings in poor condition. For the new build it was imperative that consideration be given to good design that limited future maintenance costs. The durable properties of VIVIX® panels offers a rainscreen cladding solution that is easy to clean and one that will maintain its aesthetic regardless of weather conditions or exposure to UV rays. Should the material need to be replaced, its lightweight nature and ease of application means less disruption to the running of the school. 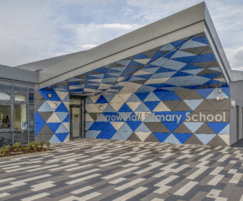 Made in Britain, VIVIX® panels for Barrow Hall Primary School were manufactured by Formica Group at its UK manufacturing plant, reducing material transportation and the overall project carbon footprint. Furthermore, in this time of post-Brexit economic uncertainty, Formica Group, as a British manufacturer, was able to provide price stability on its products to UK businesses.